Various versions of a video showing the iguana inside the toilet are circulating online. Surprise! A Miami resident found an iguana in her toilet. NEW DELHI: Imagine walking into your bathroom and finding the worst surprise possible waiting for you in there. It was something like that for a Miami woman, who was in for a quite a shock when she found a huge iguana chilling inside her toilet, reports Miami Herald. 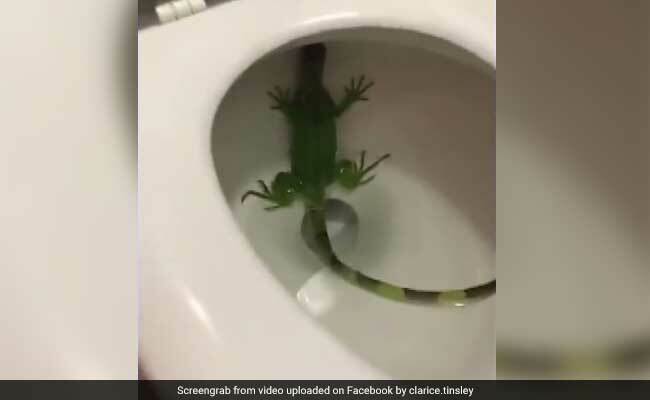 Various versions of a video showing the green reptile sitting inside the toilet are currently circulating online. One version, shared by journalist Clarice Tinsley on Facebook, has received almost 20,000 views within 14 hours. According to Ms Tinsley's post, the woman immediately called 911 for help. "I opened the door, stuck my hand in. I took a picture with my phone and when I pulled it out, I noticed it wasn't a garden snake. It's something (that's) got legs and it's moving," Gisele Quintero told WPLG Local 10. When she called 911, she was asked if her situation was an emergency. "I'm like, 'Well, not really, but we'd like to get this removed.'" Ms Quintero told WPLG Local 10. Help arrived in the form of Lt. Scott Mullin, from Miami-Dade Fire Rescue's Venom One unit, who found Ms Quintero, her children and her mother waiting for him. "This is the first time I've ever found an iguana in the toilet," he told Miami Herald. He put on a pair of gloves and took the iguana out of the toilet. The reptile was eventually sent off to a wildlife rescue center, reports Miami Herald.